The dust of the CAF Champions League draws is gradually settling and we are reexamining our readiness. It is not surprising that primary on the lips of every Enyimba fan is the need that we returned home. 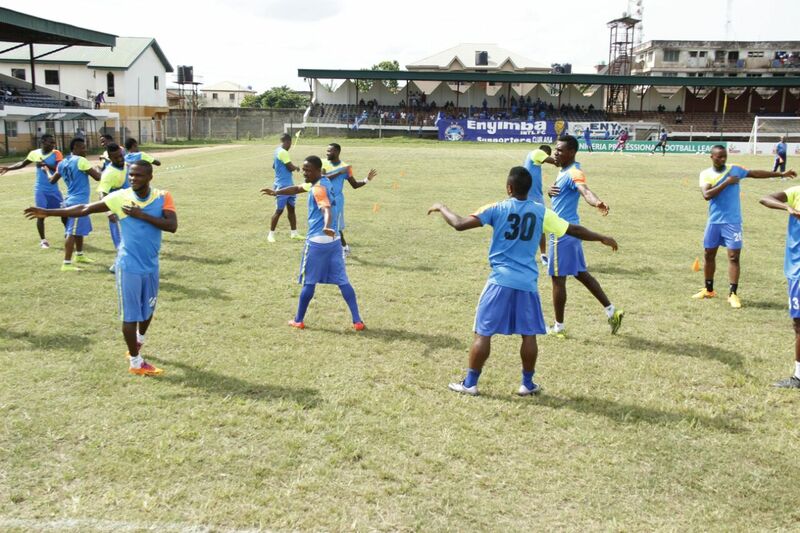 All over social media, more and more Enyimba fans are making their feelings heard and would you really blame them? I don’t, I won’t. Truth is, we just need to get back home. As we speak, our new turf is yet to arrive and work is yet to resume there. The surface is still covered in concrete and with every passing day, it’s more likely we would play Zamalek, the team you’d think is our toughest foe in the group in Port Harcourt. Aside the fact that it means that thousands of Enyimba fans won’t see that game, traveling to the backside of Port Harcourt and trying to return to Aba same say is not something I particularly enjoy. I believe I’m not alone with these thoughts. Speaking of Zamalek, news emerged yesterday that they were pulling out of their League because they feel there is a gang up by Match Officials to hurt their title ambitions and to Favour their rivals Al Ahly. Below. Zamalek will quit the Egyptian Premier League as long as Gamal El-Ghandour remains in his position as the head of the refereeing committee, the club announced. The White Castle’s board issued the withdrawal statement amid Al Ahly’s match against Arab Contractors, which saw the referee send off two Contractors players during the first half of the match. “At a time when an illegitimate goal for Maqassa was allowed to stand, two Contractors players were unfairly sent off their match against Al Ahly,” Zamalek statement read. The statement refers to Zamalek game against Misr El-Maqassa on Sunday, which saw the referee adjudge El-Sayed Hamdy’s shot to have crossed Gennesh’s line, while the replays proved it did not actually cross. Zamalek accused the referees of favouring Al Ahly, after two Contractors players were shown the red card for protesting the Red Devils first goal in their match on Wednesday. “This indicates that there is an intention to gift the league title to our rivals,” the statement added, describing the competition’s atmosphere as “unhealthy” and “unfair”. The Cairo giants have previously announced forfeiting the league in December, before withdrawing their decision one day later. Zamalek currently sit second in the league table on 60 points, eight away from leaders Al Ahly, who defeated Contractors 3-0. Well, my first reaction was, every League has it’s own unique challenges. There’s no perfect League anywhere on earth, not even the English Premier League where we see refereeing inconsistencies abound. In fact we know of some officials who tend to favour certain teams. So these things are never extinct because we are in human environment. Always, it is about how these matters are presented to the viewers and followers of the league. This is why you may never catch me advertising the shameful things that could pop up once in a while in our game. Am I denying them? No. But I just won’t be the one talking about them over social media. The message you propagate on social media seeps into the minds of the watching public and it forms a notion on the audience. Have you ever seen those adverts that say, ‘Visit Dubai’ or ‘Travel Malaysia’? I’m sure you have. Good. I was wondering to myself a couple of days ago, how come we never see anyone that says ‘Visit Nigeria’ or ‘Visit Obudu’. All of the news seeped into the outer world is that of Boko Haram and Chris Giwa and Increased Fuel Prices. Does that mean nothing good happens in Nigeria? Nothing good happens in your family? OK I know I’ve digressed a bit. My point is we just have to throw some more light on the right things happening in our country, our League, our football. In every family, family members do their best to contain unpleasant information about a member of the family and try to get it sorted without involving outsiders. We owe it to ourselves to do that for our own stuff. Country, football, Club, League. Would this incident with Zamalek mean we have a slight advantage ahead of our meeting with them on the 17th? I hope so. But that nonetheless, we just have to ready ourselves sufficiently and returning home is key. You saw the results from the Federations Cup yesterday. We play Warri Wolves on Sunday and however did Chinedu Udoji show up in my dreams last night? That’s your lot for today.